Gov. Larry Hogan announces the members of his redistricting reform commission Aug. 8. Photo from Governor's Office. Reformers want to take partisan politics out of the redistricting equation. So does the governor. That may be Mission Impossible. On the surface, their goal sounds easy to achieve. Pass a state constitutional amendment empowering an impartial panel of citizens to revise Maryland’s congressional and state legislative districts every 10 years (after the new U.S. Census is taken) so the districts conform to the Supreme Court’s 1962 “one-man, one-vote” edict. Conservative Republican Gov. Larry Hogan Jr. has joined liberal reformers in this crusade. He’s positioned himself so it looks like those mean Democrats are defiantly standing in the way. As usual, the situation is far more complicated than the cover story. The governor’s motives are hardly pure. He’s looking for political advantage for his outnumbered Republican Party. Stripping control of redistricting from the Democratic controlled General Assembly is his objective. Right now, thanks to manipulation of redistricting maps by Democratic leaders, seven out of eight Maryland congressmen are Democrats. Hogan thinks a 4-4 split would be more like it. Yet the current distribution isn’t far off the voter registration numbers. Had state and national Republican organizations given Sixth District challenger Dan Bongino more financial and organizational support last year (he lost by less than 2,800 votes), the congressional split in Maryland would be 6-2, or 25 percent. That’s almost precisely what the GOP’s registered voter figure is in Maryland today. So maybe Republicans aren’t so bad off under the current redistricting process after all. Hogan, though, believes creating more evenly balanced districts would benefit the state GOP, particularly in the General Assembly. He’s placing his bet on a non-partisan revision of legislative district lines in 2021 or 2022. That premise may not be valid, either. Republicans currently hold 30 percent of the state Senate seats in Annapolis and 35 percent of the House of Delegates seats. Both figures exceed the party’s statewide voter registration percentages. Even under Democratic control of the redistricting process, the GOP is doing better than expected. What skews such comparisons are the large number of unaffiliated voters — 672,000 of them statewide. They are neither Republicans nor Democrats yet they make up 18 percent of registered Maryland voters. Winning over these independents has been the GOP’s downfall in Maryland. When a Republican candidate reaches out to these middle-roaders, like Hogan did, success is more likely. How unaffiliated voters will react under impartially drawn redistricting maps is unknown. Nothing may change. Or everything. Miller and House Speaker Mike Busch have nothing to gain by cooperating with the governor. They understand that Hogan will do whatever it takes to help the Republican Party, with or without a new redistricting commission. They’re not going to help him in that effort. 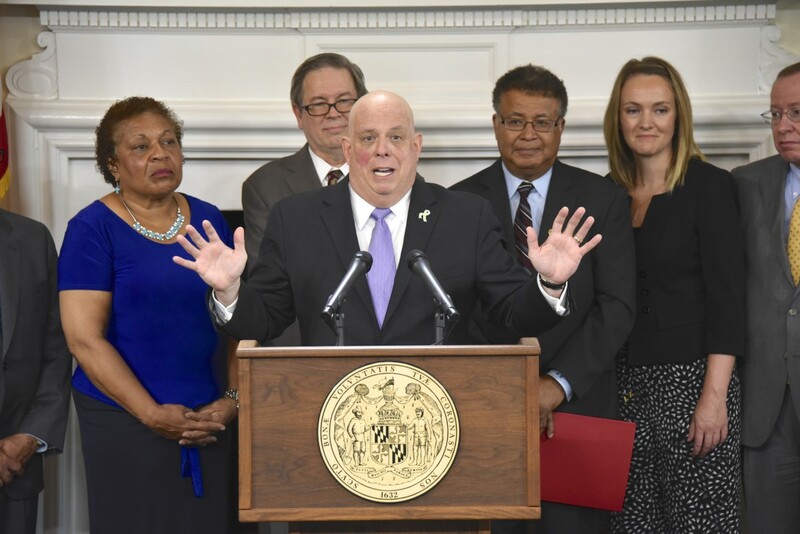 The best practical outcome would be a pledge by both Hogan and the two Democratic legislative leaders to turn to a group of impartial redistricting experts and citizens for their preliminary re-mapping of Maryland after the 2020 Census. Such early guidance from non-politicians might dissuade either side from creating the kinds of grotesque districts that now dominate Maryland’s congressional boundaries. It also might lead to more sensible boundary lines for legislative districts that respect communities of interest. Ever since the Supreme Court removed itself from most redistricting decisions, the two political parties have had a field day throughout the country twisting and turning congressional and legislative districts to their advantage. Each party has sinned mightily. Gerrymandering is a longtime American tradition, starting with Massachusetts Gov. Elbridge Gerry in 1812. Trying to remove all political partisanship from this politically sensitive process is wishful thinking. Still, we can do better than what Maryland has now. For another point of view on redistricting, see “Fairness is the place to start on redistricting reform” by Len Lazarick.